Yesterday, I, along with hundreds (if not thousands) of others received an email that appeared to be from Google. 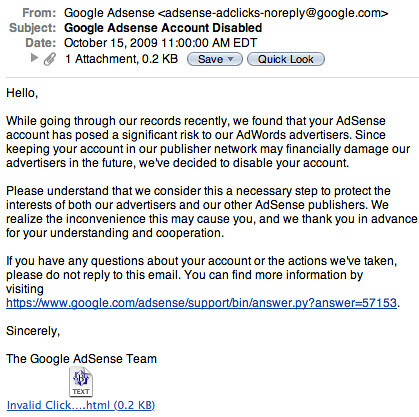 The email's subject line read "Google Adsense Account Disabled" and the email's from to looked to be from Google Adsense . It was actually caught by my spam filter and as I dug into the source code of the email, I noticed it was a scam. Beware, this is a recent phishing scam. (3) I checked if my ads were displaying and if I had any message in my AdSense console and I did not. So I trashed the email and went on. Then I noticed other people receiving this phishing email, which is why I am writing about it. Do not fall for the scam! Forum discussion at Google AdSense Help and WebmasterWorld.